Business owners looking for a low-maintenance cash back card. Take advantage of the $0 intro annual fee to maximize the unlimited 2% cash back you can earn in your first year with the card. See our full list of the best business credit cards of 2019. 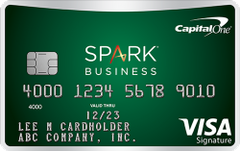 Our take: If you want a simple business credit card with a superb cash-back rate, you will love the Spark Cash From Capital One card.